Cooking cabbage on your stove can be smelly and reduces its nutritional value. The problem lies in sulfur-containing chemicals called isothiocynates that stink up your kitchen and 18.2 g per 1/2 cup serving of water soluble vitamin C that boiling water can destroy. Baking cabbage in the oven via dry heat cooking is a healthy and quick way to cook cabbage, and, as long as you do not overcook it, a less smelly method. Melt 2 tbsp. of butter or margarine per head of cabbage in your microwave oven or on your stove. Arrange cabbage pieces in a single layer on a baking sheet. Baste the entire surface of the cabbage pieces with butter or margarine and season with a sprinkling of black pepper. Adjust an oven rack to the top position. Preheat your oven to 475 degrees Fahrenheit. Bake the cabbage for 20 to 30 minutes, turning once with tongs during this time. Remove the cabbage from your oven when it is just fork tender and brown spots start to appear on the surface of the cabbage pieces. 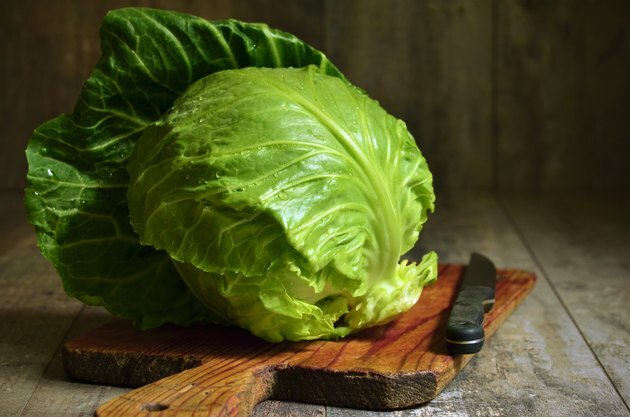 To prepare cabbage for baking, first remove the dark green outer leaves. Slice the cabbage head in half with a sharp kitchen knife. Slice each half in half twice so you end up with eight pieces. Stand each piece up and slice downward between the core and the cabbage. Discard the core. Use a stainless steel, rather than aluminum baking sheet for cooking cabbage in your oven. Chemical compounds in cabbage react strongly to aluminum and the result will be smelly. If you must use an aluminum baking sheet, line it with a sheet of parchment as an insulating layer. How Many Calories Are in Cabbage Soup?